Slug & Snail baits, poisons and traps are a quick way to get rid of large numbers of these slimy pests very quickly. They are an effective and efficient way to keep slugs and snails from wiping out your garden. Sometimes these baits are a must. Note: You can click on the links in the “Table of Contents” below to go straight to part of the review which piques your interest. What should you look for in a Slug & Snail Bait? Where can you buy Garden Safe Slug & Snail Bait? Where can you buy Monterey Sluggo Plus? Where can you buy the Ortho Bug Geta Plus? Where can you buy the Tierra Garden slug trap? There are two major types of snail and slug bait and killers formulated for home gardeners. Metaldehyde (Meta) and two kinds of iron (iron phosphate and sodium ferrate EDTA) are the most common chemical ingredients in snail and slug baits. They are usually combined with “inert ingredients” such as cereal to make it a tasty treat to attract slugs and snails. Both metaldehyde and iron compounds are effective pesticides, but metaldehyde has more potential to cause harm to the environment. If you are concerned about toxicity for dogs, cats, children, and wildlife, it is safer to use iron-based baits and killers like our #1 and #2 choices. However, sometimes you really need a product that mixes metaldehyde with a chemical called carbaryl – which is our #3 choice – the Ortho Bug Geta Plus Snail & Slug Killer. It would be toxic to bees, fish, and frogs if it wasn’t formulated with special care so it knocks out major infestations of slugs and snails without killing the wildlife you want to protect. Note that the product we recommend is made with safety in mind. No matter which bait you buy, it will only be active if you use it during the times of year when snails and slugs are active. This is usually in late spring, early summer, and the late fall. Sprinkle poison baits across the garden beds you want to protect. Don’t pile it up. Piling baits makes them attractive to pets and children. Put out baits in the late afternoon or early evening in moist and protected areas, not on dry, open ground. The best places to put out snail slug baits and poisons is near sprinklers, along garden walls, under ground cover plants, and underneath plants that show snail or slug damage. Be careful not to put them directly on the plants you want to protect. Iron bait products (our #1 & #2 choice) don’t harm earthworms. In fact, the iron helps to protect them against the toxic effects of pesticides and herbicides that may have accumulated on or washed into your garden. Iron baits don’t harm honeybees, fish, or wildlife. And they provide an important nutrient that prevents yellow leaves and stunted growth of garden plants. Remember that the bait has to be close to the ground to be eaten by slugs and snails. You don’t want to mound it up into little piles. Scattering pellets throughout your planting bed will ensure that slugs and snails find it, but pets (especially cats) and children ignore it. Don’t put out this bait on dry, hard ground or sidewalks. Snails and slugs prefer to move across damp surfaces, and aren’t as likely to find the bait on dry surfaces. Reapply Garden Safe Slug & Snail Bait after a heavy rain or deep irrigation. A copious amount of water dissolves the bait or carries it into the soil, where it will not be found. Garden Safe kills more slugs and snails than beer traps. You don’t have to spend as much time with Garden Safe as you do with beer traps. Just apply Garden Safe to your garden beds once a week. You will know the product is working two ways. First, you will see healthier, stronger plants. And you will notice snail shells, especially shells of smaller snails. Snails will simply give up eating when they feed on Garden Safe. Birds, squirrels, rabbits, and chipmunks, among other wildlife, will eat Garden Safe Slug & Snail Bait if they find it in piles. The product might make them temporarily constipated, but won’t kill them. In fact, it will ensure that they are not iron-deficient. However, scattering the bait both protects it from being eaten by wildlife and ensures slugs and snails will find it. In addition, it’s more cost-effective to scatter Garden Safe around your planting beds than it is to dump it out in little piles. And because our next product cuts back on the production of broken stems and leaves on which slugs and snails love to feed, you will get even better results if you alternate Garden Safe with our #2 choice, the Monterrey Sluggo Plus Slug & Snail Bait. Safe for pets & wildlife. Only have to apply it once a week. If you live in a moist, rainy climate then you may have to apply 2 or 3 times a week. Legal Disclaimer – Phosphorus runoff poses a threat to water quality. Some states restrict the application of phosphorus-containing fertilizer on non-agricultural lawn or turf. Check your local laws prior to purchase. A good reliable source with a number of different companies supplying this product – enabling you to easily compare prices – is Amazon. The great thing about Amazon is that “verified customers” can leave reviews rating their own experiences of using it. At the time of writing this review 260 customers have rated this product 4.4 out of 5, which is pretty good. If you want to read what customers have said about this product, then click here. Monterrey Sluggo Plus Slug & Snail Bait is supplied in pellet form and is your choice if you don’t only want to get rid of slugs and snails, you also want to kill pillbugs, sowbugs, earwigs, and cutworms. It is safe for use on flowers, shrubs, vegetables, and fruit, and inside greenhouses. It is a listed organic product that breaks down into fertilizer. It is made from Spinosad, a natural bacterium found in soil, and iron phosphate, which also naturally occurs in soil. Sluggo Plus has a 10-year shelf life. It is not diatomaceous earth, so there is no danger of breathing it in and causing lung irritation. Like Garden Safe, it actually improves the health of earthworms. It’s safe for use around people, pets, and wildlife. It is beneficial for your sod, especially if you have alkaline soil. It will prevent chlorosis, yellow leaves due to iron deficiency. It won’t dissolve in the rain. It costs a little more than Garden Safe. If you want a hassle free and quick delivery then use Amazon, and if you are a Prime member, you can get it delivered for free. Plus they have a very good return’s policy. Users have rated this product 4.5 out of 5. You can check out prices on Amazon by clicking here. Ortho Bug Geta Plus Snail & Slug Killer that works on even more kinds of garden pests than Sluggo and it exterminates army worms. It can be put out just before it rains, and it continues to work for several weeks after it rains. It gets to work fast and kills slugs and snails in just two or three days. It is about 1% sulfur, which provides the stinky smell of decaying vegetation that slugs and snails love. It also contains an interesting chemical, Bitrex. Bitrex is the bitterest chemical in the world, denatonium benzoate. Using this chemical guarantees that pets, people, and children won’t eat it. Humans can taste 1 part of Bitrex in 20,000,000 parts of anything else. Its taste is revolting at 1 part per 10,000 parts of inert matter. Ortho Bug Geta Plus Snail & Slug Killer has 1 part per 100 Birtex. But slugs and snails like the taste of this extremely bitter compound to be yummy. The combination of Bitrex and sulfur is ambrosia to them. 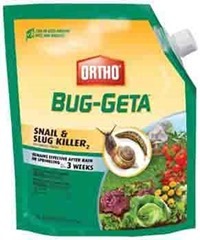 Ortho Bug Geta Plus Snail & Slug Killer also contains metaldehyde and carbaryl. Metaldehyde is a chemical that the human body makes after we consume alcohol. This chemical gives slugs and snails a hangover. They can’t move purposefully. They don’t throw up, but they produce so much slime that they become dehydrated. Carbaryl amplifies the effects of metaldehyde. It keeps the nervous system of the slug or snail from breaking down the chemical acetylcholine. Its effect is similar to playing loud music when you have a hangover. Together, the two chemicals cause slugs and snails to give up eating and quickly die. It’s the combination of metaldehyde and carbaryl that makes Ortho Bug Geta Plus so effective against so many kinds of garden pests. However, this also makes the product dangerous for other species. Although Ortho includes metaldehyde only at its safest, 2% dose, these chemicals can do real harm to pets, people, and wildlife who consume them. The Ortho Company made this product safer by making it 1% Bitrex. However, the carbaryl is still toxic to honeybees. When you use Ortho Bug Geta Plus Snail & Slug Killer, you need to remember that slugs and snails eat at ground level. Scatter the pellets. Don’t stack them into little piles that might tempt a passing bird or pet or child to taste them. Chances are that higher life forms would spit out the product, but you don’t want them to have to. The time you really need Ortho Bug Geta Plus Snail & Slug Killer is when slug or snail problems are getting totally out of hand. 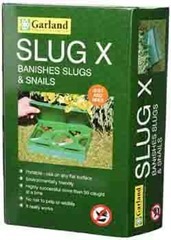 You can use this product for a month to get garden slugs and snails under control, and then switch to Sluggo and Garden Safe to keep them under control. Very effective at killing slugs & snails. It doesn’t dissolve in rain. Easy to use on garden or potted plants. Poor a little into the lid and shake over your plants. Only need to use a small amount to cover a large area. Can harm other wildlife when eaten by them. Amazon is a good place to get it. Delivery is pretty fast and they are very competitive. Click here to compare the price with similar items on Amazon. The Tierra Garden slug trap is a two-part trap with the trap attached to a lid that floats over an outer container that contains the beer. Slugs and snails fall into the inner trap, which collects them for easy removal. You simply empty the trap attached to the lid and put it back over the part that holds the beer. You can catch slugs and snails without ever touching them and you can use the beer over and over again. Scoop out a handful of earth deep enough so that the outer part is about 10 mm (half an inch) above the ground. This keeps the good insects from falling in. You can tamp it into loose, damp soil with your foot. Just don’t press too hard. Fill the “Slug Inn” with lager beer. It helps to leave the beer out for a while so it goes flat. Otherwise the bubbles make it difficult to fill the trap. You only need to fill the trap about 2/3 full. Next put the lid on the trap. The lid keeps the beer from being diluted by rain or irrigation water, and cuts down on evaporation. Leave your trap unattended overnight. The next morning, dispose of slugs and snails in your trash and return the lid for another night’s trapping. Moderately effective at controlling slugs and snails. You have to buy beer and keep it topped up. It is not as effective as baits and poisons. Not practical for potted plants. It needs to be inspected and emptied daily. Where can you buy The Slug Inn? As I previously mentioned one of the best places to buy this trap is on Amazon. You can read the feedback from users who bought the Slug Inn from Amazon, by clicking here. Baits, killers and traps never do 100% of the work of controlling pests, but they make the job a lot easier, especially during periods of heavy infestations. To get 100% control over your slug and snail problems, you will also need to invest in slug & snail repellents. The Victor BlackBox gopher trap is one of the best trapping devices on the market. Read how it compares with the other top two gopher traps. Read about the most popular rat and mouse baits. Understand the pros and cons of each and how to use them successfully.